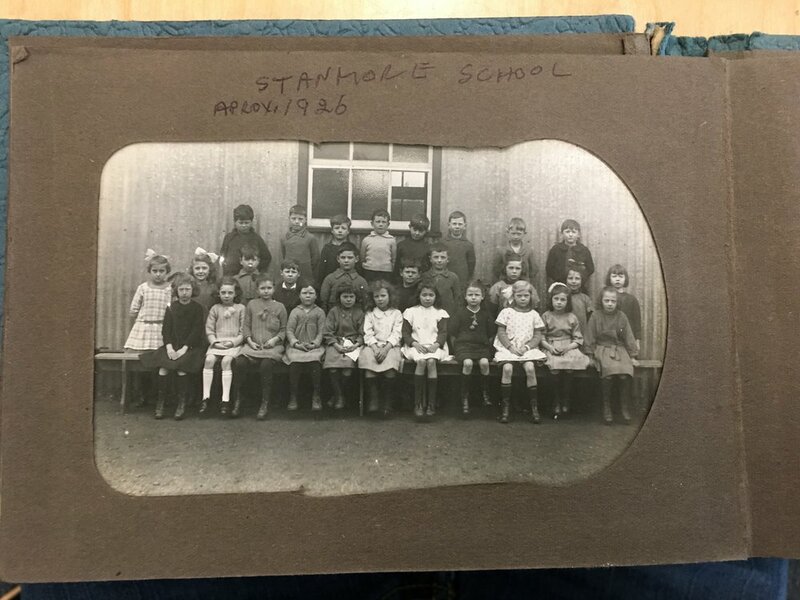 The decision to establish a school for the children of the new Stanmore Estate was made in July 1922. Families had started moving into the new estate, and the Education Committee estimated that there were 345 children living on the estate at that time. The school was to be established in a converted hut at the cost of £550. The school opened on 4 September 1922 in the St. Cross Parish Hall under Miss Annie Williams as Headteacher. Forty eight children attended school on the first day, some of whom were attending school for the first time and others who had been out of school for some time. By the time the school moved to the converted hut in Stanmore just over a month later there were fifty nine pupils on the register. The new school was opened by the Mayor of Winchester on 12 October 1922. The school continued to grow rapidly during the course of the first year, and by the start of the following academic year there were one hundred and seventy three pupils on the register. This rapid growth of a new school presented some challenges. With more and more children joining the school, with limited previous education on a weekly basis, trying to assess the children and organise them into the correct classes was no easy task. A number of teachers had to be recruited to cope with the growth. The state of public health in the 1920’s was another challenge faced by the school. Pupil’s non-attendance, or exclusion on health grounds, was frequently a challenge - particularly chicken pox, influenza and whooping cough. In November 1924, the school was closed by the Health Authority for a number of weeks in order to help prevent the spread of measles. When the school re-opened, over 40% of the children were absent due to the disease. It is clear that rain often affected attendance rates at the school too, although it is not clear as to the exact reasons why. We are lucky enough to have a first person account of the early life of the school from a number of pupils who attended the school. E A Weller (b. circa 1916) gave a written account in 1997, detailing lessons, teachers, games and how the school operated. She also mentions the ‘Beating of the Bounds’ ceremony undertaken as part of the establishment of the school. Irene Underwood gave a verbal account of the same ceremony in her audio account of the beginnings of the school (Ref). In Irene’s account, she mentions the visit of the Prince of Wales to Stanmore. The news article from the Hampshire Chronicle details the visit, the children singing, flags and banners and the Prince visiting the newly built houses. Poster giving notice of the city's proposal to provide "a new public elementary school for about 250 children at Stanmore Estate"
Notice is herby given in accordance with the provisions of Section 8 (1) of the Education Act, 1902, that the City Council of Winchester, being the Local Education Authority for the purposes of Part III of the Act, propose to provide a new Public Elementary School for about 250 Children at Stanmore Estate in the Ward of St. Thomas in the City of Winchester. The Wards of St. Thomas and St. Michael. Guildhall, Winchester, 1st July, 1922. Councillor Symes presented the minutes of the Education Committee (which have already been printed), and made a statement with reference to the conversion of a hut at Stanmore for the purposes of a school. He state that there were 345 children on the estate, of whom 179 were infants. The proposed expenditure of £550 on the work would not come on the rates, as the Committee had saved sufficient money to pay for this. Councillor Hayward asked if the Housing Committee would receive any rest for the hut? Was it economical to spend so much money on a temporary building. Alderman Shenton favoured allowing the matter to remain in abeyance until it could be ascertained whether it would not be better in the long run to have a permanent building, instead of throwing this £550 away. Councillor Furly supported the recommendation. It was quite impossible at the present time to talk about a permanent building. They did not know what accommodation would be eventually needed. At present there was urgent need for providing accommodation for infants and Standard I, children, of whom there 88, and St. Faith’s School was full. Councillor Elkington inquired whether the extra accommodation would necessitate an increase of staff? Secondly, whether all the children there would go to an elementary school. Councillor Symes answered the first question in the negative. Councillor Williams Urged that they must provide school accommodation for the children on the estate, or advertise for tenants “children not allowed.” He supported the recommendation. Councillor Mrs. Hooley, also supporting said the if the accommodation was not provided, it would mean that the 88 children would have to come into the schools of the city, which would probably result in their having to frequently prosecute the parents for the non-attendance at school of their children. Alderman Forder and Councillor Miss Du Boulay, having also spoken in support of the recommendation of the Committee to spend £550 on the conversion of the hut, the same was put and agreed to, Alderman Shenton voting against. The school is to consist of Infants and Standard I. 48 children were admitted, varying in age from 9 years to 5 yrs 3 months. Many of the children are of an age for higher standards, but they are very backwards, probably owing to the fact that they have been out of school for long periods. Some children of 6 years of age have also been admitted who have not previously attended school. There is not proper seating accommodation, neither are there cupboards in which to store materials; there will consequently be only the barest necessities to work with, and the work cannot be carried our as it should be. Official opening of new school at Stanmore by the Mayor of Winchester. Copy of the official letter received in connection with the school closing. 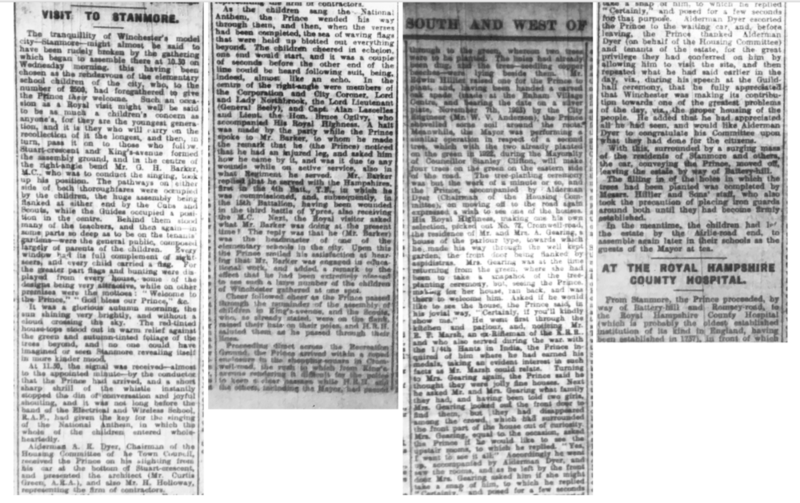 I have to inform you that the Health Authority for the City, acting on the advice of the Medical Officer of Health, have decided to close the undermentioned Winchester Public Elementary School from 4 p.m. Nov 24th 1924, to reopen on Dec 15th 1924, with a view to preventing the spread of measles. School re-opened this morning. A large number of children are reported to have developed measles during the time the school has been closed. There are 110 children present and 72 absent. I probably entered the School at about the age of six, having been a pupil at St. Faith’s School, St. Cross, for a short time. Mother would not allow me to attend St. Mary’s in Abbey Passage near the Guildhall, where a place had been allocated for me. The School building was a “tin” hut divided into Classrooms which were heated by Tortoise stoves and lit by electricity (we had gas in our homes.) Outside toilets, probably a gravel playground; classes were mixed but boys and girls were not allowed to associate on the playground. Initially all Teachers were female and, I am sure, dedicated. The Infant Teacher was a Miss Barfoot who taught my Brother Alena (born on Christmas Eve 1921) when he started school. Her classroom and probably the one above (Teacher Miss Brock) was supplied with small tables and chairs. The majority of classes used desks with tip up seats and lift up lids (books could be stored) a groove for pens and pencils and a hole for an ink pot. Ink was made from powder and water by one of the pupils, known as a monitor. Of the other Teachers I remember Miss Nicholson (she encouraged us to correspond with pupils at her former School in High Wycombe), and Miss Powell. Later a male Teacher joined the Staff. The Head Mistress was Miss Williams, an excellent teacher and a strict disciplinarian who used the cane frequently. It was unusual for me to be naughty, but Miss Williams did try to cane me on one (only) occasion. I believe I threw my notebook into the Tortoise stove, but here I may have been mistaken. I took hold of the cane and snapped it in two! By today’s standards (1997) facilities would be considered very poor, but we received an excellent education. There was no shortage of essential items, books, pens, pencils, paper, scissors for learning cutting out skills, probably coloured chalks or crayons for the infants perhaps plasticine, strips of coloured paper for making into paper chains at Christmas, etc. Lessons Scripture and spelling daily, mental as well as other arithmetic, reciting 12 times tables (how useful these have proved to be); English, specialising in grammar, parsing, simple letters and compositions, reading silently, or aloud by the teacher or individual pupils. I remember studying “Water Babies” by Charles Kingsley and Rudyard Kipling’s “Just So Stories.” Some poetry, history and geography. Singing, learning mainly English Folk Songs such as “Early One Morning” and “John Peel.” Sometimes I was asked to stand in from of the class and sing “I have a little shadow” words by Robert Louis Stevenson. Occasional “Nature Walks” up Sleeper’s Hill (I did enjoy these). We learned to measure as part of our arithmetic lessons. I do not remember learning to draw or paint, perhaps the boys did this whilst the girls learned to sew - using small pieces of calico - hemming, patching, seams; darning. We knitted socks on four (still) needles, and woe betide if anyone dropped a pin. Raffia work (girls). The boys may have played cricket or learned to do woodwork (probably when the male Teacher arrived.) Drill in the Playground and simple organised ball games using a ball but no other equipment. We had the same Teacher throughout the year except when boys and girls studied separate subjects. Younger children played singing games such as “The Farmer’s in his Den.” Both boys and girls took part in and thoroughly enjoyed the annual Folk Dance Competitions for local Schools at The Guildhall. Dances such as “Peascods”, “Selanger’s Round”, “Ribbon Dance” etc. I don’t know whether the boys had swimming lessons, but my girl friends and I learned to swim (we were allowed to use the water wings when we could nearly swim, in order - no doubt to give us confidence). These lessons took place at the Bull Drove River Baths in Garnier Road. The stones were uncomfortable to our feet but I do not think we worried about the cold water! And the Authorities and were not at that time concerned about the possibility of our contracting Weil’s Disease (spread by rats.) The College Pool, a little nearer the city was closed several years later, a College by having caught the disease. Games played in the morning and afternoon breaks, known as Playtime, including ball bouncing, often accompanied by singing rhymes (“1, 2, 3 Hilary, my ball’s down the Dairy, Don’t forget to give it to Mary, early in the morning”). Skipping. The better individual ropes had special handles to prevent the rope twisting. If a girl turned the rope twice whilst jumping once, this was known as “bumps”. Or a long rope held by two pupils; many variations, sometimes a single pupil skipping on the spot or in and out, sometimes several of us. I do not know whether we played with tops in the playground. Some were known as winder (window) breakers and could have caused damage. At certain times, boys played “conkers”. We may have played “Hopscotch”, we certainly did on the pavements. Other street games - bowling hoops, boys had iron ones, controlled by an iron hook, girls wooden hoops and a stick. There was little traffic, mainly bicycles (many errand boys delivering goods), horses and carts, very few cars - our Doctor, Dr. Hensley, had a small car. At playtime, pomegranates with their jelly like seeds were a great favourite (I did not like them). Broken biscuits could be obtained at one penny a (small, conical paper) bag for sweet ones, on halfpenny for plain. Sweets such as gobstoppers and liquorice laces were great favourites and could be obtained from Mr. Waldin in Stanmore Lane, who was blind and undertook boot and shoe repairs. The School Nurse visited frequently in order to inspect heads for nits or ringworm and to detect conditions such as impetigo. I was sent to the Clinic in The Square on several occasions for treatment of conjunctivitis. Such diseases as whooping cough, chicken pox, measles etc. were frequent, and if one had scarlet fever or diphtheria one was sent to the Victoria Fever Hospital, in Morn Hill for about six weeks isolation. I do not remember the Smallpox Hospital at Crabwood ever being used. TB was common, and the father of one of my friends lived in a hut in their back garden. The School Doctor (Dr. Bruce Young, a miserable looking man) came occasionally. There was no privacy, but no-one worried. Children returned home at Mid-day - there were no school meals, I do not think any children brought sandwiches. All lived near the school and Mothers did not go out to work. A few children from very poor homes sometimes went into the Town where they were provided with a hot meal (I believe this contained a lot of potato) at “The Welcome” in High Street. There was great poverty and some mothers took in washing. Strict economy was needed to make ends meet (and there were no fridges or washing machines for better off families). Some very poor families could not afford to have a Doctor (there was no National Health Service as we know it) attended the Dispensary adjacent to the Museum in The Square. Many families paid into Clubs to cover any necessary doctor’s bills, or into a scheme to enable the services of the district nurse to be received free of charge in case of need. Many belonged to the Hospital Contributory Scheme to cover free treatment at the Royal Hants County Hospital. To return to School matters. There was NO ASSEMBLY, and NO SCHOOL UNIFORM. Even girls such as myself wore lace up boots in winter; boys’ boots were laced differently. Boys wore short trousers. Those of us who passed the Scholarship Exam (not then known as “11 plus”) went on to Peter Symonds (as my Brother did) or girls to the Winchester County Girls’ School in Cheriton Road (now the Westgate) or to the very good Central School COED Danemark in Gordon Road (there was a separate exam for this). Danemark later moved to Romsey Road, the School on the site is now St. Bede’s. I rather think the School catered for pupils up to the School Leaving Age - 14, later 15. I WAS VERY HAPPY THERE. I have forgotten to mention one special occasion. There was great excitement on the occasion of the visit to the Estate of the then Prince of Wales. We children lined the Street adjacent to the School and waved little “Union Jack” flags. I took part in the BEATING OF THE BOUNDS for the new School in Stanmore Lane. We each held a small brand of evergreen (laurel?) and marched around the site boundary. To the Best of my Belief, all I have stated is correct. It was a glorious autumn morning, the sun shining very brightly, and without a cloud crossing the sky. The red-tinted house-tops stood out in warm relief against the green and autumn-tinted foliage of the trees beyond, and no one could have imagined or seen Stanmore revealing itself in more kinder mood. At 11:30, the signal was received –almost to the appointed minute– by the conductor that the Prince had arrived, and a short sharp shrill of the whistle instantly stopped the din of conversation and joyful shouting, and it was not long before the band of the Electrical and Wireless School, R.A.F., had given the key for the singing of the National Anthem, in which the whole of the children entered wholeheartedly. Alderman A. K. Dyer, Chairman of the housing committee of the Town Council, received the Prince on his alighting from his car at the bottom of Stewart Crescent and presented the architect (Mr Curtis Green, A.R.A. ), and also Mr H. Holloway representing the firm of contractors. As the children sang the national anthem, the Prince wended his way through them, and then, when the versus had been completed, the sea of waving flags that were held up blotted out everything beyond. The children cheered in echelon, one end would start, and it was a couple of seconds before the other end of the line could be heard following suit, being, indeed, almost like an echo. In the centre of the right angle were members of the Corporation and City Coroner, Lord and Lady Northbrook, the Lord Lieutenant (General Beeley), and the Capt. Alan Lascelles and Lieut. the Hon. Bruce Ogilvy, who accompanied His Royal Highness. A halt was made by the party while he (the Prince) spoke to Mr Barker, whom he made the remark that he noticed he had an injured leg, and asked him how he came by it, and was it due to any wounds while on active service, also in what Regiment he served. Mr Barker replied that he served with the Hampshires, first in the 4th Batt., T.F., in which she was commissioned, and, subsequently, in the 15th Battalion, having been wounded in the third battle of Ypres, also receiving the M.C. Next, the Royal visitor asked what Mr Barker was doing at the present time? The reply was that he (Mr. Barker) was the headmaster of one of the elementary schools in the city. Upon this the Prince smiled his satisfaction at hearing that Mr Barker was engaged in educational work, and added, a remark to the effect that he had been extremely pleased to see such a large number of the children of Winchester gathered at one spot. Cheer followed cheer as the Prince passed through the remainder of the assembly of children in Kings Avenue, and the Scouts, who, as already stated, were on the bank raised their hats up on their poles and H.R.H. saluted them as he passed through their lines. Proceeding direct across the recreation ground, the Prince arrived within a roped enclosure to the shopping-centre in Cromwell Road, the road in which from Kings Avenue rendering it difficult for the police to keep a clear passage while H.R.H. and the others, including the Mayor, had passed through to the green, whereon two trees were to be planted. The holes had already been dug, and the tree seedling copper beaches were lying beside them. Mr Edwin Hillier raised one for the Prince to plant, and, having been handed a carved oak spade (made at the end of the Enham Village Centre, and bearing the date on a silverplate, November 7th, 1923) by the City Engineer (Mr W V Anderson), the Prince shovelled some soil around the roots. Meanwhile, the Mayor was performing a similar operation in respect of a second tree, which with the two already planted on the green in 1922, during the Mayoralty of Cllr Stanley Clifton, Will make for trees on the green on the eastern side of the road. The treeplanting ceremony was but the work of a minute or so, and the Prince, accompanied by Alderman Dyer (Chairman of the Housing Committee), on moving off to the road again expressed a wish to see one of the houses. His Royal Highness, making one his own selection, picked out No. 72 Cromwell Road, the residence of Mr and Mrs A Gearing, a house of the parlour type, towards which he made his way is through the well-kept garden, the front door being flanked by aspidistras. Mrs Gearing was at the time the returning from the green, where she had been to take a snapshot of the tree-planting ceremony, but, seeing the Prince making for her house, ran back, and was there to welcome him. Asked if he would like to see the house, the prince said, in his jovial way, “Certainly, if you would kindly show me.” He went first through the kitchen and parlour, and noticing Mr E F Marsh, an ex-Rifleman of the K.R.R., and who also served during the war with the 1/4th Hants in India, the Prince enquired of him where he had earned his medals, taking an evident interest in such facts as Mr Marsh could relate. Turning to Mrs Gearing again, the Prince said he thought they were generally fine houses. Next he asked Mr and Mrs Gearing what family they had, and having been told two girls, Mrs Gearing looked out the front door to find them, but they had disappeared among the crowd, which had surrounded the front part of the house out of curiosity. Mrs Gearing, equal to the occasion, asked the Prince if he would like to see the upstairs rooms, to which he replied, “Yes, I want to see it all.” Accordingly he went up, accompanied by Alderman Dyer, and saw the rooms, and as he left by the front door Mrs Gearing asked him if she might take a snap of him, to which he replied “Certainly,” and posed for a few seconds for that purpose. Alderman Dyer escorted the Prince to the waiting car, and, before leaving, the prince thanked Aldermen Dyer (on behalf of the Housing Committee) and tenants of the estate, for the great privilege they had conferred on him by allowing him to visit the site, and then repeated what he said earlier in the day, viz. giving his speech at the Guildhall ceremony, that he fully appreciated that Winchester was making its contribution towards one of the greatest problems of the day, viz. the proper housing of the people. He added that he had appreciated all that he had seen, and would like Alderman Dyer to congratulate his Committee upon what they had done for the citizens. With this, surrounded by a surging mass of residents of Stanmore and others, the car conveying the Price moved off, leaving the estate by way of Battery Hill.